Help for families struggling to pay for quality child care, such as the federal Child Care and Development Block Grant (CCDBG), is, pivotal to supporting quality child care in the nation. Strategically, states are already investing CCDBG funds in raising the quality of child care programs, as well as in efforts to improve affordability of and access to child care that support workforce participation throughout the economy. We need data from states to understand the child care landscape and help guide state and community-level decision-makers, policymakers, child care advocates, and program administrators in their push for accessible, affordable, quality child care. Checking In: A Snapshot of the Child Care Landscape – 2017 Report summarizes services provided by child care resources and referral agencies (CCR&Rs), as well as costs, health and safety standards, and the supply and demand of child care in individual states. Furthermore, the report includes the characteristics of families in and out of the workforce, along with their level and type of need. This year’s state fact sheets include new information related to states’ QRIS, health policy, and emergency preparedness initiatives, as well as a deeper look at the types of requests fielded and referrals offered by state CCR&Rs. 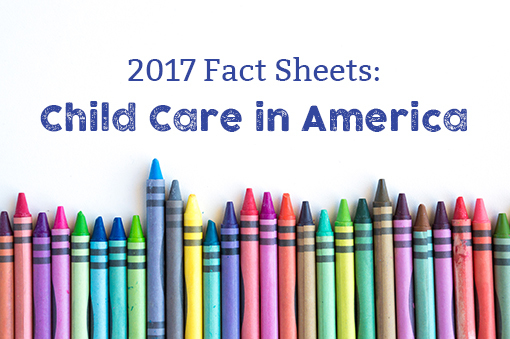 Based on the findings in this year’s report, Checking In: A Snapshot of the Child Care Landscape – 2017 Report, and the ever expanding portfolio of literature on the effectiveness and positive return on investment for quality child care, Child Care Aware® of America recommends the expansion of funding provided through CCDBG to increase investments in child care. Our country must quickly recognize the value of child care as a setting in which early childhood education is already occurring and a vital support for many working families. Recognizing these values will enable our country to remain competitive in the 21st-century global economy. Check out information on your state’s child care landscape. As you review the state fact sheets, you will notice that many of our states are already investing CCDBG funds in raising the quality of child care programs, as well as in supports for workforce participation throughout the nation. It’s still not enough! Let your state and national representatives know—expanded investments in child care quality, affordability, and access lead to positive outcomes for all children, their families, and our country.